Required for those individuals that work in restaurants and other non-restaurant facilities such as nursing homes, licensed day care homes and facilities, hospitals, schools, and long-term care facilities. The Learn2Serve Food Handler Training Certificate program is to provide individual’s working in restaurants and non-restaurant facilities with an overview of food safety issues, regulations, and techniques to maintain a food-safe environment. These individuals will also be able to better understand how handling food correctly reduces risks. Illinois food handler safety training is necessary for employees in the food service and hospitality industry. Illinois food safety training is for employees (such as chefs, cooks, servers, preparers, vendors, caterers, supervisors and managers) who are involved in preparing, storing, or handling food that work in: (restaurants, bars, cafes, bakeries, delis, mobile food trucks, assisted-living, day care centers, and convenience stores). Illinois requires each retail food establishment to have a person-in-charge, an owner, or manager of a food establishment be a Certified Food Manager (CFM) as outlined in the FDA Food Code by successfully passing an accredited ANSI food safety certification exam. The Illinois Food Handling Regulation Enforcement Act (410 ILCS 625), amended by SB1495, passed into law on August 27, 2013 establishes food handler training requirements and changes the existing training and certification requirements for food safety managers, as well as establishes food handler training requirements. Beginning July 1, 2014 all food handlers employed by restaurants will be required to receive or obtain ANSI accredited training in basic safe food handling principles within 30 days of employment and every 3 years thereafter. 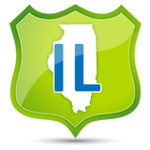 Businesses with internal training programs and assessments approved in another state as of August 27, 2013 will receive automatic approval in Illinois upon providing proof that their program is approved in said state. Select county health departments in the state may also offer training if the program is approved by the IDPH. ANSI accredited training such as the Learn2Serve Food Handler Training Certificate Program is transferrable between employers. Internal training programs are not transferrable between employers. We offer online Food Safety Training in Illinois for: Chicago, Aurora, Rockford, Joliet, Naperville, Springfield, Peoria, Elgin, Waukegan, Cicero, Champaign, Champaign-Urbana, Bloomington, Arlington Heights, Evanston, Decatur, Schaumburg, and many more! Chicago, Evanston, Peoria, Champaign, Naperville, Springfield, Schaumburg.